“What Did You See Beneath the Terebinth Tree?” from Christian Faith Publishing author Sandra McLeland is a creative and original story book of rhymes for toddlers that will make young readers and parents laugh. “What Did You See Beneath the Terebinth Tree?”: a fun story book for toddlers written in rhyme. “What Did You See Beneath the Terebinth Tree?” is the creation of published author, Sandra McLeland. Sandra McLeland resides in the high plains of Northwest Iowa with her husband of 42 years. Her inspiration comes from the beauty of God’s creation, the love of family, and a lifelong dream of writing. Published by Christian Faith Publishing, Sandra McLeland’s new book is a story of rhymes for toddlers. 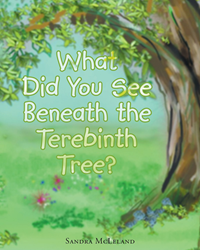 “What Did You See Beneath the Terebinth Tree?” is a story for toddlers. Parents and small children alike will enjoy the rhymes and the playful characters within the pages of this book. Young readers will laugh with the pictures as parents read the playful words. View a synopsis of “What Did You See Beneath the Terebinth Tree?” on YouTube. Consumers can [purchase,“What Did You See Beneath the Terebinth Tree?” at traditional brick & mortar bookstores, or online at Amazon.com, Apple iTunes store, Kobo or Barnes and Noble. For additional information or inquiries about “What Did You See Beneath the Terebinth Tree?”, contact the Christian Faith Publishing media department at 866-554-0919.